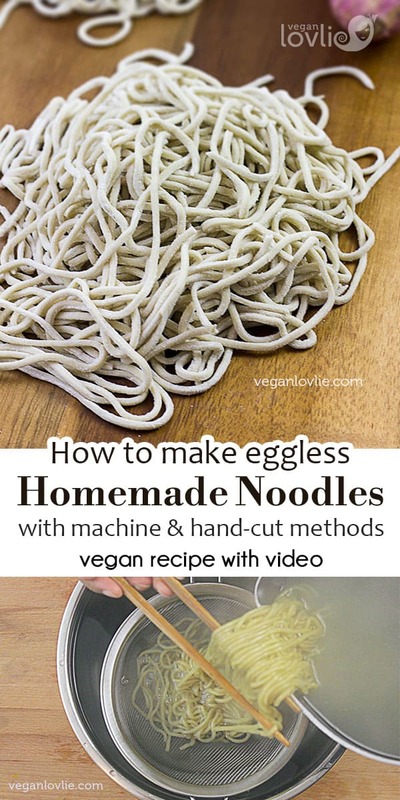 Easy process on how to make homemade vegan noodles from scratch. Homemade ramen noodles. 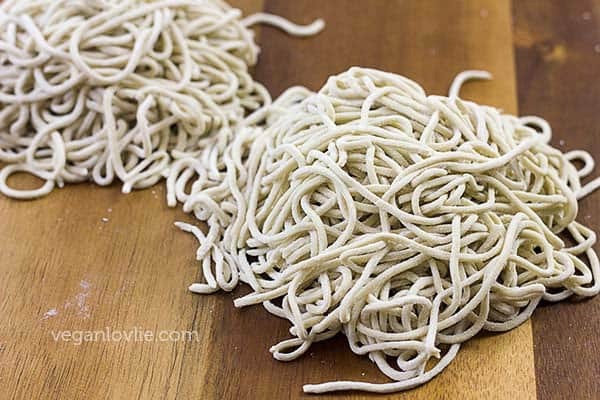 These alkaline noodles are similar to the Mauritian yellow wheat flour Chinese noodles. Suitable to use as ramen noodles for soup, boiled with various toppings or in stir fried noodle dishes. With strong Chinese influences in the Mauritian cuisine come an amalgam of flavours, ingredients and combinations that moulds traditional Chinese food into something notably unique to Mauritius. Whilst still highlighting their origin, Mauritians have put their own stamp onto the food introduced by the Chinese over a century ago. Having lived and experienced the food culture in quite a few countries, it is now plainly evident to me that while many dishes bear some resemblance and influences of similar origins, Mauritius boasts a multitude of distinctive food that can be found nowhere else on the globe. 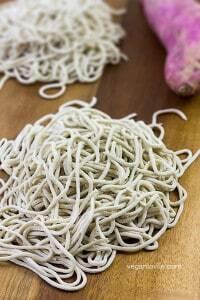 One example is the unmatched yellow wheat noodles that is locally produced. 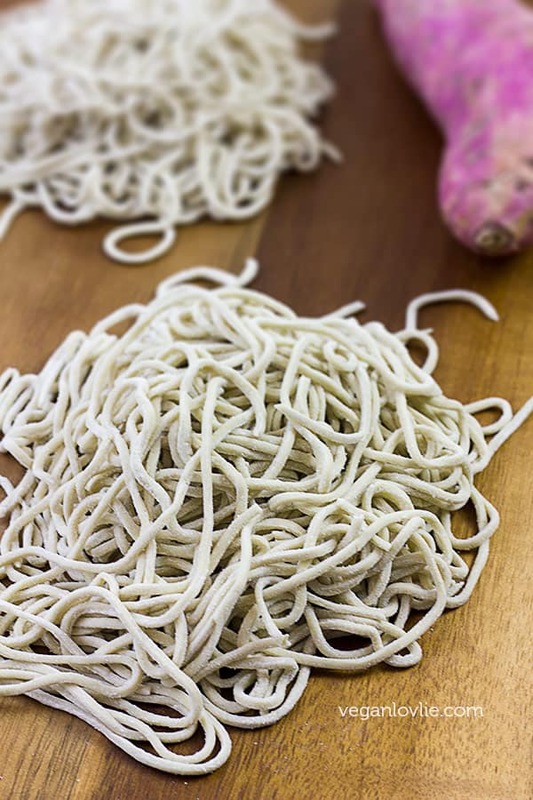 Our fruitless search for the perfect commercially available yellow wheat noodles, that would be similar to the ones that we have in Mauritius, brought us to getting our hands into dough. After numerous trials and tests, we finally nailed the combination and proportion of ingredients that gave birth to a noodle texture and taste that pretty much captures the authentic Mauritian appeal. A lot less daunting than what they appear to be, these homemade noodles come together rather quickly. With the kneading time and rest time being a lot more reasonable than bread making for instance, this dough is also by far easier to work with. These vegan noodles, a riff on the quintessentially Chinese staple, have all the elements of the Mauritian classic wheat noodles. Being neither too chewy nor too mushy, they work perfectly for either fried noodle dishes (chow mein), boiled with toppings or in soups. 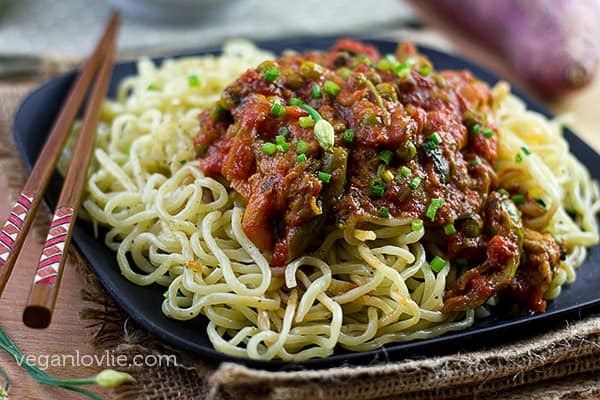 Typically, the Mauritian wheat noodles are less chewy than other types of noodles like the packaged dry noodles available in the Asian markets or the Japanese ramen types of noodles. Commercial noodles manufacturers make use of alkaline salts known as kansui to achieve that springy toothiness. Kansui is actually a mixture of sodium carbonate and usually potassium carbonate, as well as sometimes a small amount of phosphoric acid. If you are lucky enough, you may be able to find kansui in Chinatown or Asian markets but I wanted to come up with a recipe that would make use of ingredients that are easily accessible to most people. Kevin and I figured out if you want to attempt making your own noodles, it is very probable that it might be because you live in an area where Asian ingredients are not commonly available. A familiar alkali salt found in most kitchens is baking soda but it is not strong enough to yield the supple-firm texture. So, a little research landed us on this article in the New York Times that introduced us to the idea that it is possible to use the same baking soda but processing it to a stronger alkali by baking it. Hence ‘baked baking soda’ is the key ingredient in this recipe. When baking soda is baked, it turns from sodium bicarbonate into sodium carbonate which is an stronger alkaline salt. After a few tests, we were able to determine the ratio of flour to alkali salt and water needed to produce noodles similar to the ones that are commercially available in Mauritius. Apparently, alkaline noodles date back to ancient China where the water that were used from wells proved to be of alkaline pH. The Noodle Road is quite an insightful Travel Documentary hosted by Ken Hom as he tracks down the secrets of this simple but unique food. 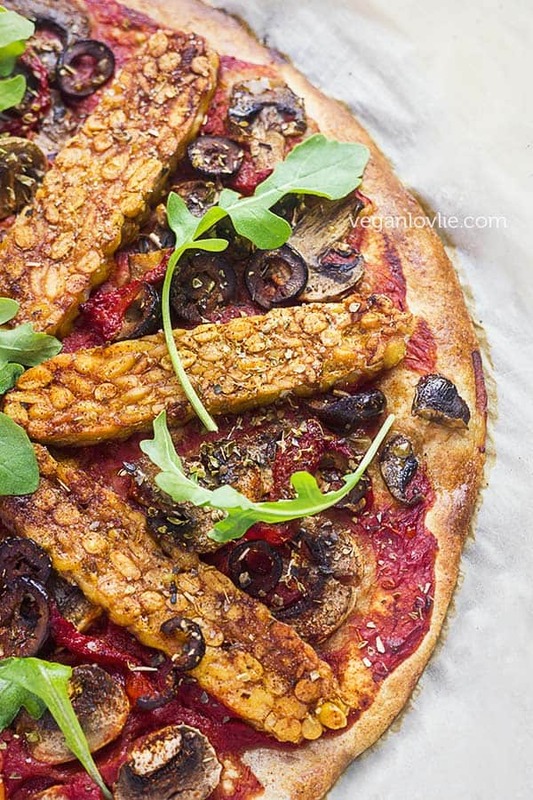 Erring on the side of adventure while experimenting, we incorporated our own twist to these classic vegan noodles with the addition of sweet potato in the dough. The subtle sweetness was enough to add unexpected flavour depth to these plain noodles. We used the white variety of sweet potato, although the orange one will work too. 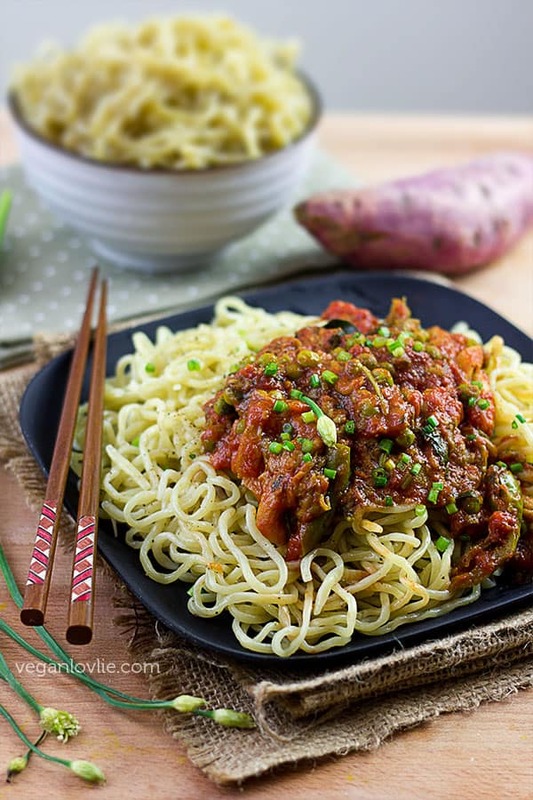 We are sharing both recipes below – plain noodles and sweet potato wheat noodles. 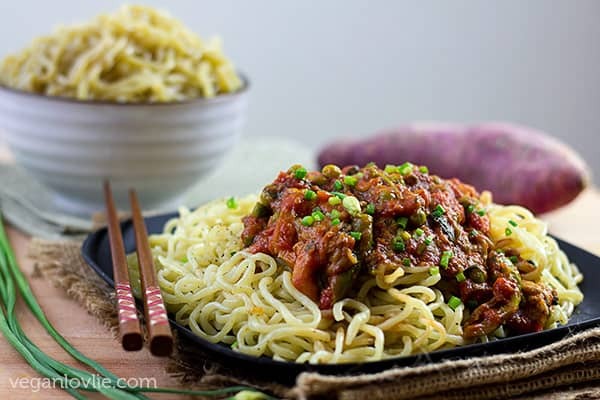 Apart from trying these vegan noodles in a fried noodle dish, it was only natural for us to gorge on them freshly boiled and paired with our traditional rougaille — a quintessentially Mauritian combo. This is the type of food that literally brings tears to your eyes. The simplicity of this dish, like many Mauritian dishes, is what makes it a winner. Watch the video tutorial as Kevin demonstrates his newly found passion for making these vegan noodles. Sprinkle a few spoonfuls (or about half a cup) on a baking sheet lined with parchment paper and spread out evenly. Bake for one hour on low temperature at 120 degrees Celsius (or 250 degrees Fahrenheit). Remove from the oven and allow to cool before transferring into a jar. If you plan to make your own noodles often you may want to bake a greater quantity of baking soda and keep it in a jar for later use. Baked baking soda keeps for about 6 months in a sealed jar. IMPORTANT NOTE: Baked baking soda is a stronger alkali (sodium carbonate). You should avoid touching it with your bare fingers as it will cause skin irritation. So, store it properly out of the reach of children and pets. Mix the baked baking soda with the warm water until completely dissolved. In a large mixing bowl, add the flour and sweet potato (if using). Pour in the water mixture. Mix with a wooden spoon first and try to form a dough. Once all liquid is absorbed into the flour, go in with your hand and start kneading into the bowl until a smooth dough is obtained. Then continue kneading the dough on a lightly floured surface for about 5 minutes. Roll the dough out, fold and roll out again. Do this two to three times. This quite a resistant dough so you will need a little bit of strength to roll this. 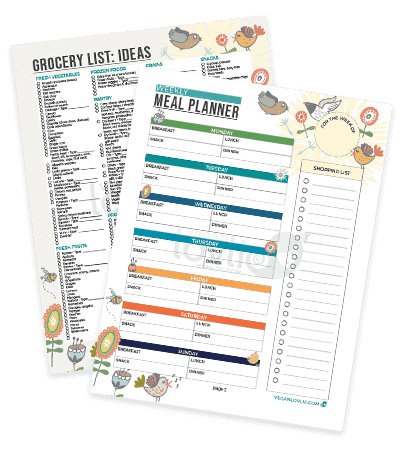 Then fold into a rectangle and place in a reusable plastic bag or wrap in cling film or simply place in a closed container. Allow the dough to rest for one hour at room temperature. After the dough has rested, take it out of the bag and cut into two equal parts. Roll the dough out flat, using a rolling pin, to a large rectangle of about 1 mm thick. The dough is quite springy and will tend to retract. So, you will need to use a little bit of strength like before to roll it out thin enough. Dust the flattened dough with a little tapioca or potato starch. This will prevent the layers from sticking and will make it easier to unroll the noodles afterward. Then roll the dough onto itself a few times to create a flat log. 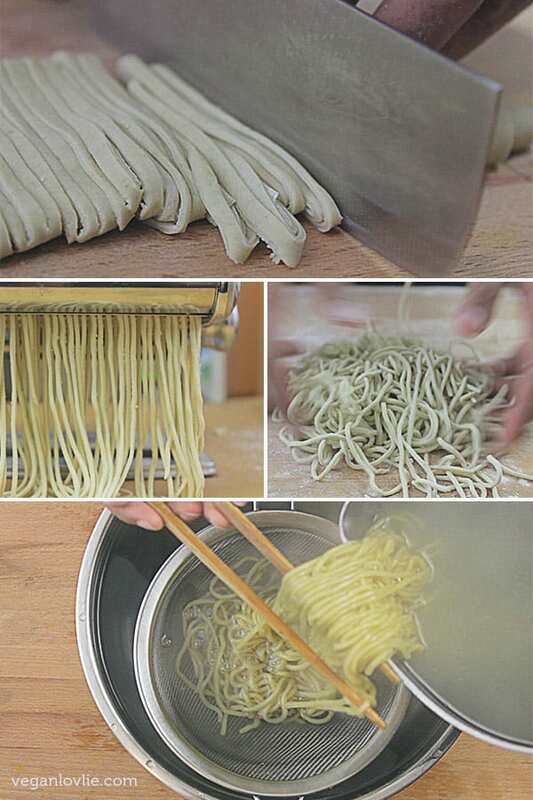 Cut thin strips of about 1-2 mm depending on how thick you like your noodles. Sprinkle with a little tapioca or potato starch. Mix and fluff the noodles to evenly distribute the starch. This will prevent the noodles from sticking. Pass the dough a few times in the roller section of the pasta machine. Fold and pass through the machine again. Adjust the thickness to your liking. We set the thickness to 6. Then pass the dough through the cutter to form the noodles. Sprinkle with some tapioca or potato starch and fluff the noodles to evenly coat the starch onto the noodles. These noodles are fresh and only require 2 to 3 minutes (or even less depending on how thin you have made them) to cook. To cook, bring about a large pot with water to a boil. Drop in the noodles. Stir lightly to avoid them from sticking. Once cooked, remove from the hot water and plunge in some cold water to firm up the noodles. You may then reheat them by immersing them in some hot water again before serving. If you are using these noodles in a soup, you may slightly under-cook them and transfer directly from the boiling water into the soup. They will continue to cook a little. 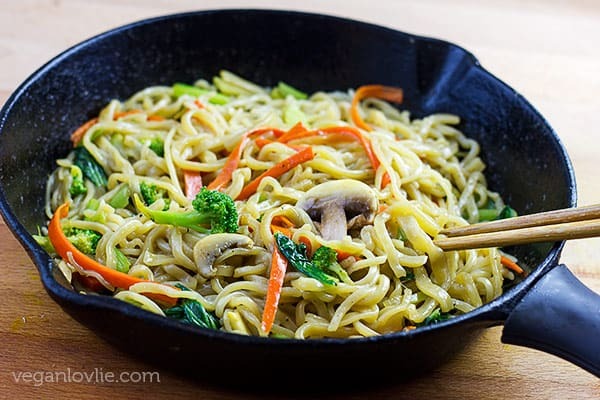 If you are using these noodles for fried noodle dishes, only half-cook them, rinse them in cold water and then stir fry them with the vegetables as per the recipe. 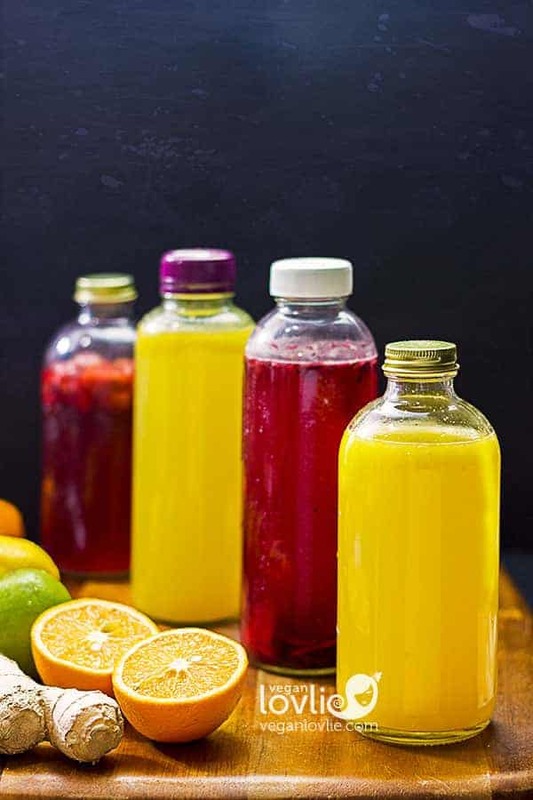 The juices released by the vegetables and sauces will be enough to cook them further. These noodles can be kept for longer in the freezer. Just divide them into portions in reusable plastic bags and freeze until needed. Then cook (as above) directly from frozen, no need to defrost. Alternatively, you can blanch the fresh noodles for 30 seconds, rinse then in cold water, add a little oil and coat them evenly. Then place in plastic bags and keep in the fridge for one day. These will then be ready for stir-frying. Homemade vegan noodles that are similar to the commercially available yellow wheat flour noodles. This is an easy recipe that yields delicious noodles to go with soup, eaten boiled with toppings or for stir fried dishes. Sprinkle a few spoonfuls (or about half a cup) on a baking sheet lined with parchment paper and spread out evenly. Bake for one hour on low temperature at 120 degrees Celsius (or 250 degrees Fahrenheit). Remove from the oven and allow to cool before transferring into a jar. If you plan to make your own noodles often you may want to bake a greater quantity of baking soda and keep it in a jar for later use. Baked baking soda keeps for about 6 months in a sealed jar. In a large mixing bowl, add the flour and sweet potato (if using). Pour in the water mixture. Mix with a wooden spoon first and try to form a dough. Once all liquid is absorbed into the flour, go in with your hand and start kneading into the bowl until a smooth dough is obtained. Then continue kneading the dough on a lightly floured surface for about 5 minutes. Roll the dough out, fold and roll out again. Do this two to three times. This quite a resistant dough so you will need a little bit of strength to roll this. Then fold into a rectangle and place in a reusable plastic bag or wrap in cling film or simply place in a closed container. Roll the dough out flat, using a rolling pin, to a large rectangle of about 1 mm thick. The dough is quite springy and will tend to retract. So, you will need to use a little bit of strength like before to roll it out thin enough. Dust the flattened dough with a little tapioca or potato starch. This will prevent the layers from sticking and will make it easier to unroll the noodles afterward. Then roll the dough onto itself a few times to create a flat log. Cut thin strips of about 1-2 mm depending on how thick you like your noodles. Sprinkle with a little tapioca or potato starch. Mix and fluff the noodles to evenly distribute the starch. This will prevent the noodles from sticking. Pass the dough a few times in the roller section of the pasta machine. Fold and pass through the machine again. Adjust the thickness to your liking. We set the thickness to 6. Then pass the dough through the cutter to form the noodles. Sprinkle with some tapioca or potato starch and fluff the noodles to evenly coat the starch onto the noodles. These noodles are fresh and only require 2 to 3 minutes (or even less depending on how thin you have made them) to cook. To cook, bring about a large pot with water to a boil. Drop in the noodles. Stir lightly to avoid them from sticking. Once cooked, remove from the hot water and plunge in some cold water to firm up the noodles. You may then reheat them by immersing them in some hot water again before serving. These noodles can be kept for longer in the freezer. Just divide them into portions in reusable plastic bags and freeze until needed. Then cook (as above) directly from frozen, no need to defrost. Alternatively, you can blanch the fresh noodles for 30 seconds, rinse then in cold water, add a little oil and coat them evenly. Then place in plastic bags and keep in the fridge for one day. These will then be ready for stir-frying. 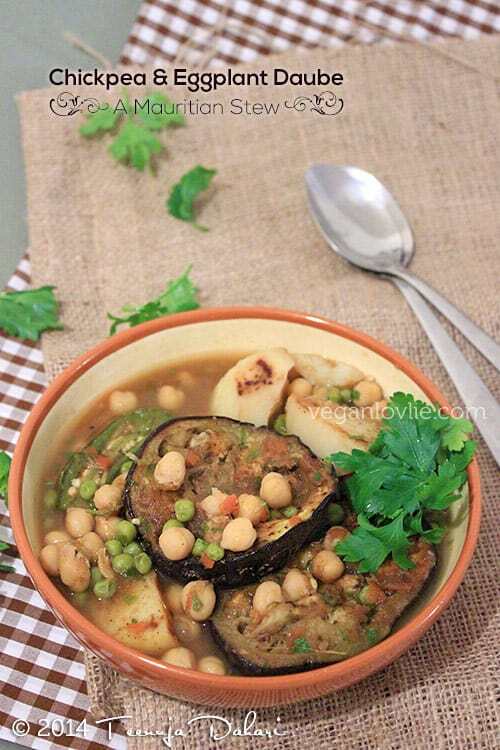 Love this homemade vegan noodles recipe? Pin it for later. I like your recipes. Is it possible to make the Ramen noodles gluten free? Bob’s Red Mill has a gluten free flour mixture. I’m wondering if it would work just the same, or if there is another gluten-free option available.? I have personally not tried this recipe with any gluten-free flour mix so I don’t know how the dough will hold up and how easy it will be to make it into noodles. Also, I don’t know how they’ll do when boiled. It might be worth trying though. If you do, let me know how they turned out. Is it possible to substitute the baked baking soda with baking powder? Hi Salomé, to answer your question, no, baking powder is not the same as baking soda. Baking powder does not have the same chemical reaction and will also taste very bitter. Baking soda is very easy to find at all grocery stores.